These stud earrings feature twinkling round 0.25ct diamonds in a 9ct white gold rubover setting. 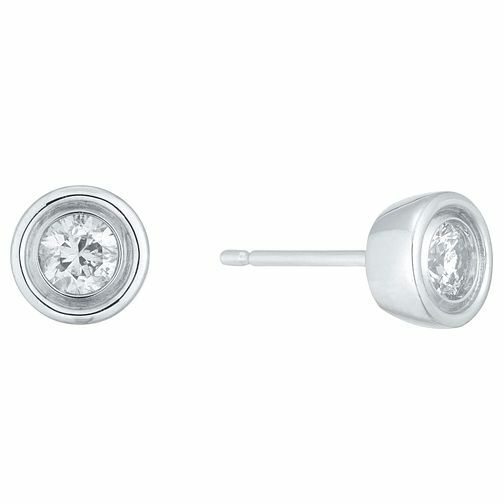 9ct White Gold 0.25ct Diamond Earrings is rated 3.5 out of 5 by 2. Rated 3 out of 5 by Anonymous from Disappointed with quality The design and shape of these studs are lovely, however, when my set were delivered one of the backs was rattling around loose in the box. Long story short, I returned them and received another pair two weeks later only to find the same problem. I have returned this second pair and fingers crossed it is third time lucky. At this price though I did expect better quality! Rated 4 out of 5 by Anonymous from Scored me lots of points with the Mrs... Bought these earrings for my fiancée for Valentine’s Day and she loved them... To be honest, I was apprehensive when I gave them to her as they are smaller than the webpage makes you think they are. Perhaps an idea would to use a head model as 1 of the photos when displaying these sort of items ? Overall, the quality was good, the boss loved them, which in turns means I’m happy !! Hope this helps ?